Barons’ annual Yuletide Classic & Collectors’ sale traditionally ends the year on a high note, and the list of early entries for the 2011 Yuletide auction in the Surrey Hall at Sandown Park on December 13th contains some real treats. 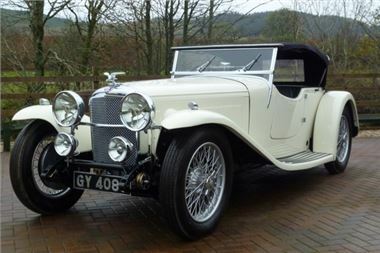 Headlining those early entries is an outstanding and exceptionally rare, 1932 Alvis Speed 20 SA two-door Sports Tourer. Alvis’s London agent Charles Follett Ltd. commissioned the renowned coachbuilders Van den Plas to build the stunning open-topped body, and the car – which still boasts that original body – comes complete with a copy of the original factory build sheet. A full ‘matching numbers’ car, it has been the subject of a comprehensive, body-off, restoration over the past five years, regardless of cost, including a £10,000 engine rebuild, £5,000 gearbox rebuild, new leather seats and trim, overhauled or replaced suspension bushes springs/shocks, new honeycomb radiator and water pump seals. The car also has full weather gear (i.e. soft-top and tonneau cover). The estimate for this very rare example of what is arguably the most desirable Alvis model weith good investment value is £95,000-£120,000. Other cars due to go under the hammer at Sandown Park on December 13th include a 1969 Mercedes-Benz 280SL Pagoda (£21,000-25,000) and a charming, and highly original, 1966 Daimler V8-250 saloon which has had just two owners from new (£14,000-16,000).